When I was a teenager (way back in the 1970s), I was lucky enough to be able to attend dozens of rock concerts staged in Los Angeles, (aka the City of Angels). Rock music was life to me, and probably due to 7 years of piano lessons I was in love with prog rock. My collection of records and concert tickets included Genesis, Yes, Jethro Tull, and Pink Floyd, along with what I felt were the highest quality rock bands like Zep, The Who, Queen, and Kansas. Music patronage became a lifelong passion for me. The concerts at that time were becoming amazing spectacles, with elaborate theatrical productions. As the lyrics were often as important as the music to me, the fact that many bands dramatized the themes of certain songs, or even whole concept albums made for artful theater. I wrote this book as a “love letter” to rock musicians of the ‘70s— focused ultimately on the concerts and the films that captured them. I used only photos of the bands live in concert – no portraits. I wanted to show and tell the story of these concert performances from the standpoint of a fan, hoping a reader would relate to a guy who might have been a few seats down the row at these shows, who might have raved about what we just saw on the way home. As an example of a chapter, one covers the Genesis tour The Lamb Lies Down on Broadway. There are fantastic shots by Armando Gallo, a Melody-Maker cover showing Gabriel’s grotesque Slipperman costume, pages from the concert program, a ticket stub from the date at the Los Angeles Shrine auditorium, and sample frames from the film. The written material illuminates the album and tour, the special effects, and the film of the production’s slide show, which many fans might not realize exists (it’s on the 71-75 box set). This was a blueprint for all 36 bands covered. How long has it taken to research and write? At one level its taken 45 years of “field research,” record collecting, and study. But from the time I started writing and finding the photos it all took 2.5 years. I spent a lot of this time tracking down a selection of iconic photographs from around the world, sometimes digging through archives at agencies, others directly with the photographers of that day. I was fortunate to meet several of those photojournalists including Neal Preston, Armando Gallo, Neil Zlozower, and Lisa Tanner, who opened their archives for me at their studios or homes. I could not believe how many amazing shots exist that have never been seen by fans, shots that captured our musical heroes in their prime. Another thing that took a lot of time was combing through more than 100 rock films from the decade, all part of my private collection. You and I know that TV appearances, professionally filmed 35mm movies—even celluloid left in the can for years, sometimes decades after light hit the film—are finally getting home video or streaming media release. I remember going to see many of these films at the local cinema that featured Led Zeppelin, Yes, AC/DC, Alice Cooper, Paul McCartney and Wings, and so many others. Now, just about every major band of the rock world can be seen performing live in one format or another, thanks to Eagle Rock Entertainment, Warner Home Video, and others who are helping to keep their legacies alive. I’m still that guy, the one who collects the high quality digital transfers available on media, rather than streaming them. Having said that, many of these films are available on streaming services like YouTube. Were there any gigs you didn’t go to which you wished you had seen? Oh yeah! For each band I had to select what I think in retrospect was their finest hour –the best album and concert, and the best film covering that band, hopefully for that same tour. In the case for instance of Jethro Tull, I had not seen the Passion Play tour, but I knew through older friends and research that it would have been for me their best, and that is my favorite Tull record after all. Same with Genesis’ Lamb tour, though tribute band The Musical Box recreated it professionally just recently. In a few examples, I did not get to see the band in the ‘70s but instead did catch them later. Only three bands out of 36 eluded me completely. I was never inclined to see AC/DC (although I did enjoy the great film, Let There Be Rock! ), and Happy The Man never toured the west coast (and, there is no film!). The worst mistake was missing the mighty Led Zeppelin. In the case of the Zep ‘77 tour, I loved Presence, and that was the concert to see, but I was instead booked to see Pink Floyd’s Animals concert just weeks before and budgets kept me from seeing more than one show every couple months. What was the best gig you ever saw? All of that is in the Genesis family – I will never forget the Wind & Wuthering tour in 1977, and the first time I saw Peter Gabriel solo at the Roxy Theater the next year. But number one was Gabriel’s tour for his 4th album (also dubbed Security) which came early in the ‘80s – it’s a bit of a cheat as I cover that show in this “70s” book, but it’s really for me, the epilogue of the ‘70s decade. He absolutely stunned the audience and finally emerged on his own at the level of performance he had achieved while in his former band. Armando Gallo’s unbelievable shots give a very good idea of the drama. As there is literally no film of this seminal tour, we examine the So movie, particularly those songs he performed in the same way as that prior tour (like “Lay Your Hands On Me”). Others in the top tier include Paul McCartney’s Wings Over America tour, Queen’s News of the World tour during which Freddie held the audience in complete awe, Kansas Point on Know Return featuring Steve Walsh giving the most physical performance I’ve ever seen, Dixie Dregs with their stunning virtuosity, Camel, ELO – so many incredible shows I will never forget. For the Floyd, while Animals was spectacular, I suffered a bit of “bad vibe” that night in the gi-hugic Anaheim Stadium, and it was eventually to be Roger Water’s restaging of the Wall this decade that became the ultimate live experience of that band’s music for me. How did you go about the picture research? This was the most difficult part of the book’s production, hands down. Thank God for Google, but even with all the search engines in the world, it was amazingly difficult to find some of the photographers and shots that eventually did appear in the book. One snap alone, of Camel in concert with the London Symphony Orchestra on the night they recorded The Snow Goose together, took 7 months to find and it was sitting in the vaults at The Daily Mail, having also been recently unearthed by a researcher at PROG magazine (RIP). I never found shots of Ambrosia and Happy The Man until I actually reached a member from the band themselves, who had boxes “in the attic” with old shots and memorabilia. A lot of the shots in the book came from slides I was allowed to borrow and scan at Dickermans in San Francisco. Well, this book was so expensive to produce that I have to sell all the copies I ordered during this year. Provided that happens, I will move to the next decade, sliding into the ‘80s with late ‘70s punk, then covering the era of New Wave music, including bands like Depeche Mode, The Cocteau Twins, Japan, Echo & The Bunnymen and so many others that were part of the second “British invasion!” I’m really looking forward to that as I’ve not seen any great ‘80s genre books that include what for me were the best bands of that decade with any kind of stunning photography. Hey ma, I got the cover! I still have a copy of the Beatles record, Rubber Soul that came out when I was six years old in 1966, and which I played repeatedly, sneaking into my sister’s room to use the record player. At that early age I became a complete Anglophile. Ten years later, I was spinning anything out of Britain from the progressive rock acts of the time, including Jethro Tull, Yes, Genesis, Camel, Gentle Giant, Pink Floyd, and more. But it all started with the Beatles as it did for so many musicians and fans born during our time. Many reference the Beatles and producer George Martin’s work on the famous Sgt. Pepper’s Lonely Hearts Club Band from 1967 as setting the stage for the progressive rock music that followed. But, Rubber Soul is still my favorite Beatles record. The tour to support it would be their last, as they performed their final show in San Francisco, at Candlestick Park, on August 29, 1966. The follow up album Revolver had just come out that same month, though no tracks were performed on the tour. Instead they did eleven songs, three from Rubber Soul, and headed home to the studios to work on Sgt. Peppers. 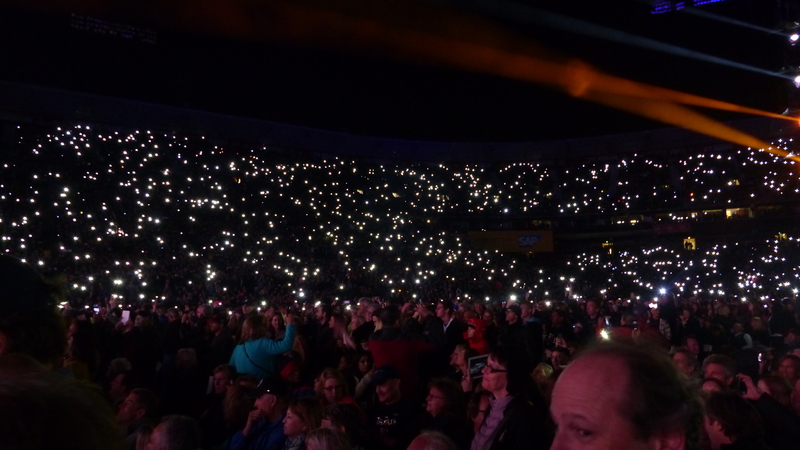 Fourty eight years later, last week on August 14, 2014, Paul McCartney returned to play the last show that will be staged at the now aged Candlestick Park, a venue that will be demolished after the event. It’s fitting closure to that now decrepit site, as it hosts one of the most important musicians of our times, and beloved son of Britain, who is in part responsible for the deep love of music so many of us have experienced. The show was absolutely fabulous! Paul and band played an eclectic set during a three hour extravaganza, including my favorite track “I’ve Just Seen a Face” that opens the Capital Records release version of Rubber Soul. 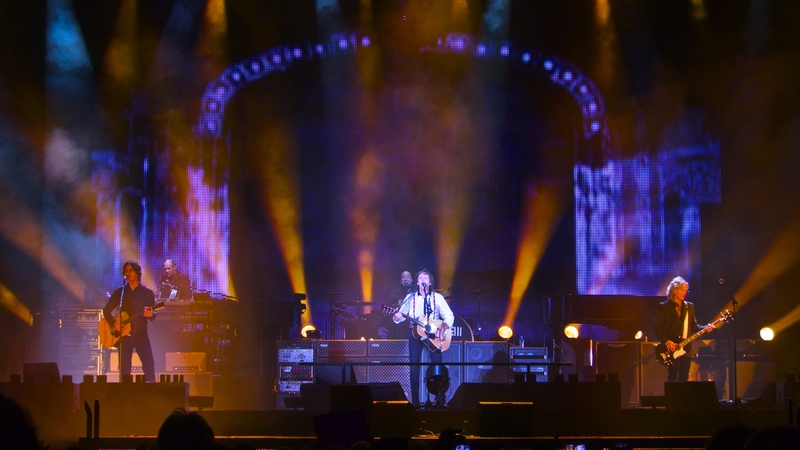 Although not much was changed in Paul’s set list to commemorate the Beatles last show, he did mention the event, and added “Long Tall Sally” to the set list, which has only been played a few times since that final night, nailing it’s grinding vocal. So for the most part, we witnessed a typical night on the mighty “Out There” tour. Paul’s voice held up very well through the set list, and his bass, guitar and piano work are undiminished by time. A favorite moment for me was his guitar riff and vocals on “Let Me Roll It” – a smoky Wings rocker and tour staple. Throughout the set, The band accompanied him with precision, and captured original sounds and more modern interpretations where needed. Drummer Abe Laboriel Jr. is particularly exuberant during the show, and keys player Paul “Wix” Wickens plays beautifully and covers a great many sounds including winds instruments from his kit. Guitarists Rusty Anderson and Brian Ray fill out the band that have now been playing together since 2002 – something that shows in their delivery. 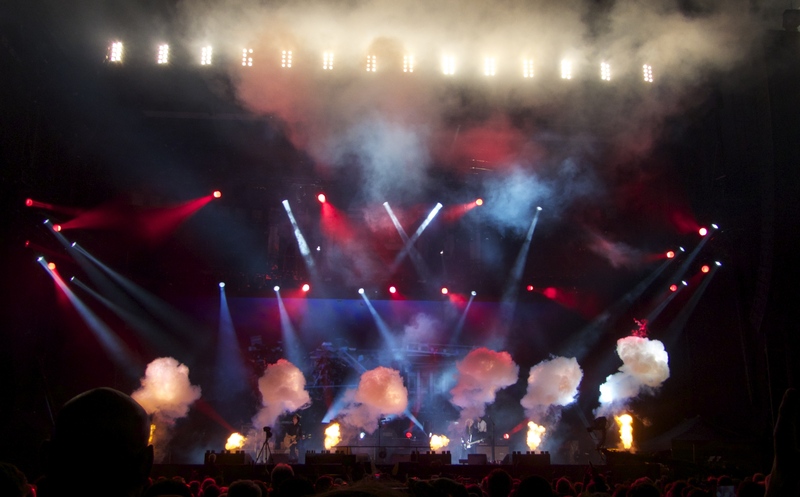 Stage craft for this tour is tasteful – powerful lighting rigs, and multiple screens which lit up with photos, short films and graphic imagery. These were particularly effective during “Back in the U.S.S.R.” as they displayed images from the former Soviet Union. One bit that didn’t work for me was a large riser that carried Paul half way up the stage height while he was playing “Blackbird” as it seemed to detract more than add to this delicate gem of a song. Most exciting were the pyrotechnics during the Wings “Live and Let Die” as fireworks and lasers shot from the large stage during the instrumental segments. The first time I saw Paul McCartney play was in Los Angeles during the 1977 Wings tour. As an aside, there is a wonderful new DVD that captures that tour on it’s Seattle stop. At that time the awesome Venus and Mars record had just released. Most of that record and other Wings material was performed back then, with only a few Beatles tracks. Paul included some Wings favorites this time out including “Band on the Run,” “Listen to What the Man Said,” and “Hi, Hi, Hi” among others. But at this point Paul plays more Beatles tracks, including early hits like “Eight Days a Week,” “All My Loving,” “I Saw Her Standing There,” “Paperback Writer,” “Day Tripper,” “We Can Work It Out,” a very beautiful version of “Eleanor Rigby” and a particularly sweet rendition of “And I Love Her.” Mid period Beatles tracks included “For the Benefit of Mr. Kite” and “Lovely Rita” from Sgt. Peppers, along with “Lady Madonna,” “Ob-La-Di, Ob-La-Da,” “Hey Jude,” Let It Be,” and the coda from Abbey Road. At one point Paul pulled out a ukulele and a short anecdote about George to start a sweet rendition of “Something.” At that point, as on “Let It Be” quite a number of iPhones raised as candlelights reflected our emotions. 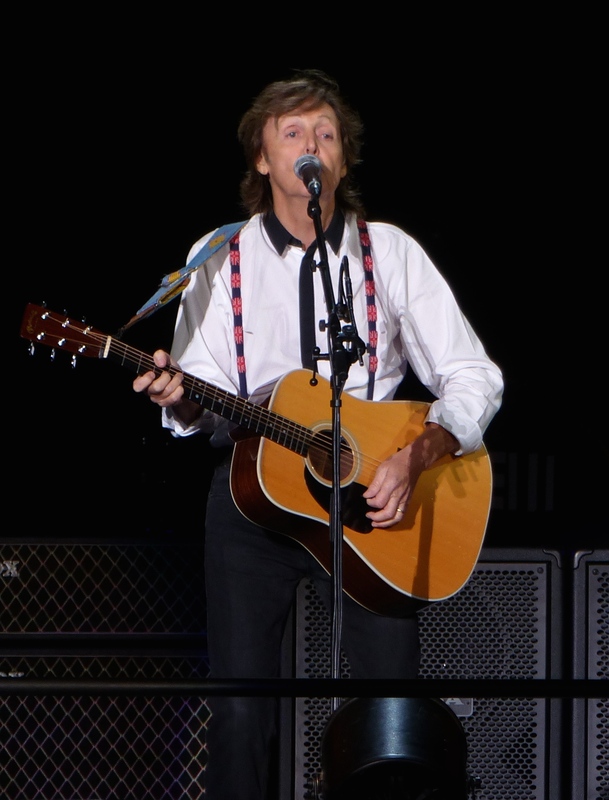 Several new Paul McCartney solo tracks were played including the fun ditty “Queenie Eye” from New, and the touching standard “My Valentine.” But the night belonged to the Beatles songs, which rightly receive fan adulation and the respect deserved for this member of one of the greatest bands ever assembled and all his work that has followed. 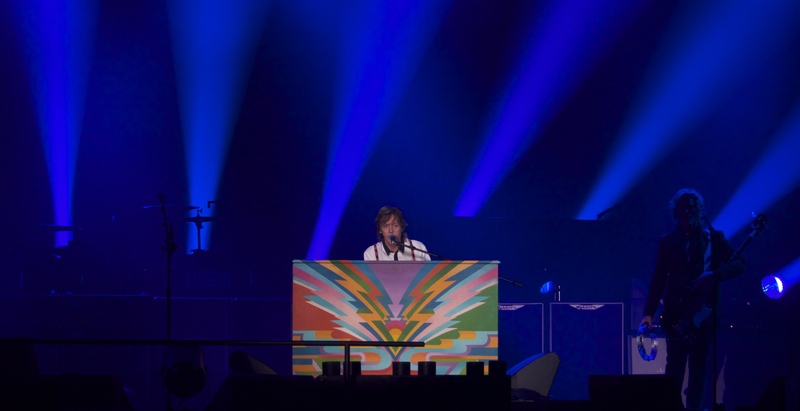 It’s a long set list and a wonderful experience – on this night a fitting send off to the old Candlestick Park as Paul winds through his second year on this worldwide tour.